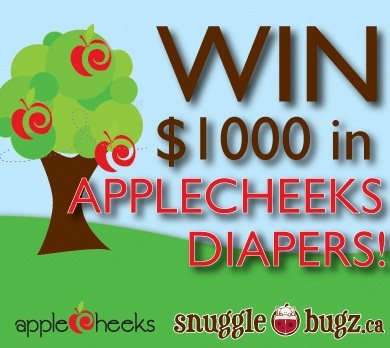 Today is the first day of this amazing contest where you have a chance to win a diaper cake full of wonderful Apple Cheeks cloth diapers from SnuggleBugz.ca! $1000 in Apple Cheeks diapers, to be exact! 9 One-size inserts, in bamboo. 1 Storage Sac, size 1. 3 super plush bamboo terry wipes. The size 1 diaper fit Ethan very well. Right now he’s about 8 lbs and there’s definitely room to grow but it fits well and did not leak at all. This diaper is an envelope cover, which is different from a lot of the diapers out there…but it’s different in a good way! And I’ll tell ya why! As the picture below describes, it is very easy to stuff this diaper…with whatever you choose! At first I have to admit I was skeptical…how would I get an insert out if the diaper is all poopy…eww! But with newborn poop anyway, all the poop has thus been contained in the front part of the diaper, making it easy to get the insert out still! BUT even if poop does get in the backside, the insert comes out in the wash! NO NEED TO UNSTUFF! Just put the poopy diaper in the diaper pail as is, and wash away! The lining is ridiculously soft. This is part of what makes it so worth it to me to cloth diaper my babies! Having nice, soft, luxurious ApppleCheeks micro-fleece lining against their bums! I can also attest that the stretchy elastic has also contain potential blowouts! As you can see in my pictures, the bamboo inserts can either be used on the outside of the envelope, like you would a prefold, so all you have to so is change the bamboo insert, or you can stuff it into the envelope! I love that this diaper is so versatile. Also? Bamboo is one of the most absorbent materials in the cloth diapering world so this works awesome at nighttime for my super soaker newborn! All in all? I love AppleCheeks diapers and I’m proud that they are Canadian made…just like me! And now is your chance to win! Win! A diaper cake made completely of Apple Cheeks products, worth $1000, has been assembled and is waiting for one lucky Canadian winner to take it home (or have it delivered). Also, AppleCheeks is generously giving away one diaper (size, color, & insert) of your choice to one of my readers open to Canadian & US residents!How To Enter Facebook fans will have a 10-day window to take photos of themselves or their little ones “going green” and submit the photo and story on the Snuggle Bugz Facebook page. After 10 days of submissions, the participants will need to acquire votes on their photo, from November 25 – December 1. The most votes at the end of the voting week will win the diaper cake containing $1000 worth of Apple Cheeks products. To enter my giveaway, use the Rafflecopter widget below. If you don’t see it, please click the “Read More” link! The first entry is mandatory. Visit AppleCheeks and tell me which color you’d choose and which insert you’d like – microterry or bamboo – by commenting on this blog post. Once you complete this entry, it will unlock the rest! Any questions? Just ask!